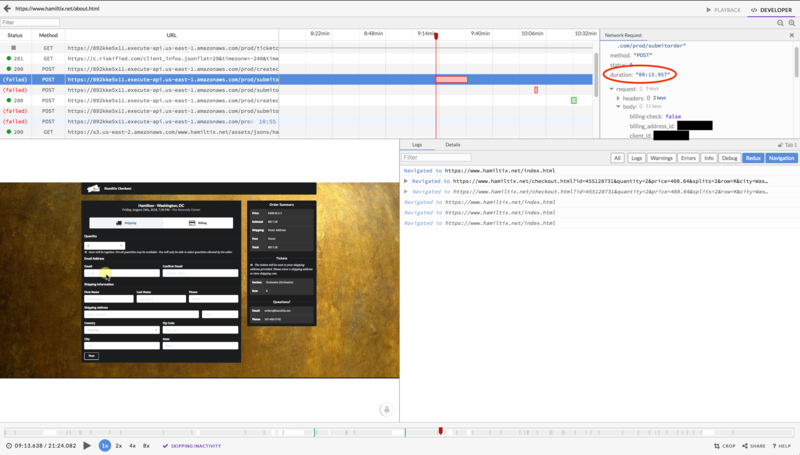 Designing notifications, analytics, and proper logging into your web application allows the weekend critical errors to be triaged and fixed fast enough to keep everything running smoothly. The link to LogRocket is an affiliate link. As they don't have an official affiliate program I'm not sure if anything will come of it, but for transparency I am disclosing my affiliation here. There are many alternatives, but LogRocket has been great and offers a free tier! It was Saturday, 8:21 P.M. I'd just returned home when I got a Pushover notification. The few error notifications we have gotten are in a query or other part of the website that is a "first step" of the user experience. By the time a user gets to the point where they are interacting with "TheMoneyLambada" the order is complete (hence the name). What this means is that a user was trying to purchase tickets when this occurred. Priority: Critical. I sit down at my laptop and open the CloudWatch dashboard. All Lambda standard out or logging messages are captured by CloudWatch, so this should show exactly what caused the error. Immediately I saw the error, "Invalid Ticket Group Quantity." Like all tricky bugs I immediately thought, "That's impossible!" The details of the order are all checked with the broker immediately before purchase. TheMoneyLambda should never be handling an order that hasn't been checked for correctness. The check is handled by a separate lambda, so flipping over to those logs I see that it was checked successfully. About this time I get another error notification, same as first. Worried the customer is getting error messages and attempting to buy the tickets multiple times, I fire off a quick email (captured at checkout) to them letting them know I am looking into the issue. The pressure was on now. I have no idea how this bug was possible and I'm about to loose a customer. With a grand total of $0 spent on marketing, word of mouth and this blog is the only driver of sales. A bad customer experience could torpedo the whole project. In LogRocket I pick out the session right away and watch the user interaction from the beginning. Every thing looks normal, except the ajax calls to API Gateway (and therefore Lambda) fail. Then I see it. LogRocket helpfully captures all the details about ajax calls, and I notice the duration is about 15 seconds. 15 Seconds, why is that familiar? No errors, no traceback. Apparently a successful order. In my initial haste to find the issue I was focused on the errors and missed the fact they were preceded by a successful order. The function must have timed out just before sending the successful order notification and returning a 200 status to the front end. For some reason the broker's API took ten seconds to respond, which in turn caused our Lambda function to hit its time limit of 15 seconds, but not before actually processing the order! The user saw an error on the site, while at the same time getting a confirmation email. I communicated the issue to the customer, who was really great about everything, and immediately increased the execution time limit for TheMoneyLambda. With Lambda aliases, you have to make the change in the Lambda's dashboard then push a new version to all aliases you want changed. This prevents you from accidentally changing a parameter or environment variable that a current alias requires when updating a function. With the GitLab pipelines described in my previous post its as simple as re-running the deploy stage. If the broker API had failed completely, or was a little faster this error wouldn't be possible. It was just slow enough to succeed on the back end while failing on the front end. Instrumenting business critical functions to receive instant error notification is key to knowing there is a problem. Quick communication with affected customers can help smooth over an otherwise bad experience. During testing, ensure you test less-than-optimal conditions to include very slow responses. In the market for Hamilton the Musical tickets? Find a better ticket search, alert, and buying experience at hamiltix.net.